For every hundred people standing in front of “The Bean” on a weekend, chances are that only six of them use a 312 area code. Like grandma’s nice china, we’ve got fun for when visitors come, and then we’ve got the real day-to-day stuff. So where do you go after Wrigley, Navy Pier, and that first true Chicago dog? Here’s the deeper dish on the city’s realest offerings. Don’t blame us if you wake up with a Chicago flag tattooed on your inner forearm. It’s easy to overlook everything tucked away on the Riverwalk. Maybe you’ve already sipped rosé all day as you watch the boats from City Winery’s patio, or talked turkey at Tiny Tapp. 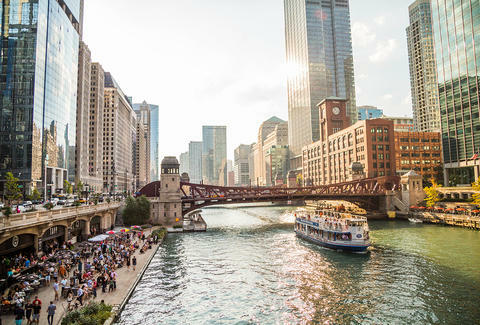 But walk the water and you’ll find new surprises -- kayak rentals, fishing spots, public art, and the McCormick Bridgehouse & Chicago River Museum -- to gain a new appreciation for the city’s aquatic overpasses. 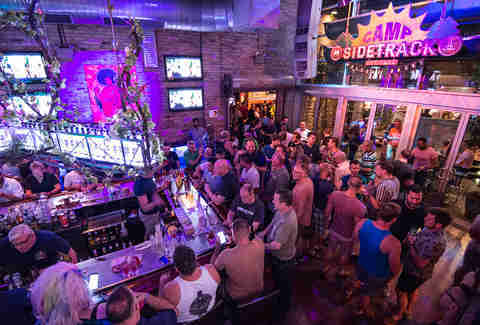 For 36 years, Sidetrack has reigned supreme as the physical and spiritual center of Boystown. When it opened in 1982, the decor was lacking: Seats at the bar were comprised of beer boxes, and there wasn’t even a window. Many years and renovations later, the venue has grown; up to a thousand revelers can now choose from six individually themed bar areas extending over eight storefronts’ worth of space. Whether you want to check out one of their many events or drink amid beautiful decor, you’re on the right track. Chicago’s public lakeshore imbued downtown with fantastic biking options -- and Bike and Roll can help you take advantage of them. With tours that range from quick jaunts around Navy Pier to four-hour beer tours reaching Pilsen, there’s fun for both new and experienced riders. And if knees or other ailments keep you from hitting the pedals, Bike and Roll also offer Segway rentals as well. Popular? 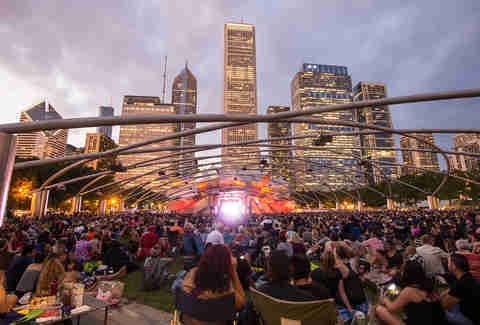 Sure, but Millennium Park is Chicago. If one activity unites Chicago’s varied communities together, it’s the Summer Series. There’s nothing like watching half the city dance to classic house music, then return next week to cry their eyes out at Coco. You can work hard on that beach bod during their summer slate of Saturday morning fitness classes. Or you can kick back with a snack: The park encourages you to picnic. Just make sure someone sets up prime picnic blanket turf early in the afternoon. The pizza history of Chicago is as dramatic as the opinions of the pizzas themselves. Competing family members, stolen recipes, even arson -- suffice to say the people making pizza are even more zealous than those eating it. While tourists have their own half-baked opinions about deep dish and stuffed pizza, the pies from Lincoln Park mainstay Pequod’s please visitors and locals alike. Founded by legendary pizza chef Burt Katz, his legacy (and recipe) have been carried on by strong public demand. The trick is in the crust -- a foccacia-like bite above the rest, caramelized to perfection in a well-seasoned skillet. Beyond the lake, Chicagoans have a growing number of bike paths to choose from. Of these, none is more prominent than the sky-high 606 path, a creative reuse of the old Bloomingdale Trail. Stretching from Ashland Avenue to the western trailhead at Ridgeway, the path offers travelers of all conveyance a beautiful view of the west to near-west side (and a safe bike route for commuters). 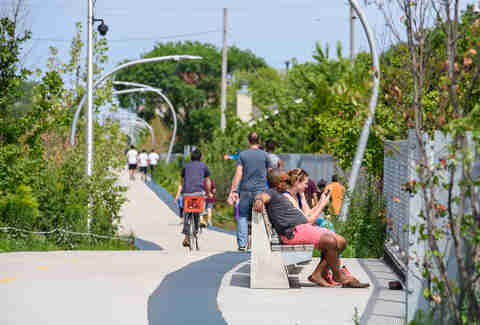 Existing parks connect with ones specially created within the trail -- so visitors can stop as they please to play, relax, and enjoy the views (especially on the bridge over Humboldt Avenue). 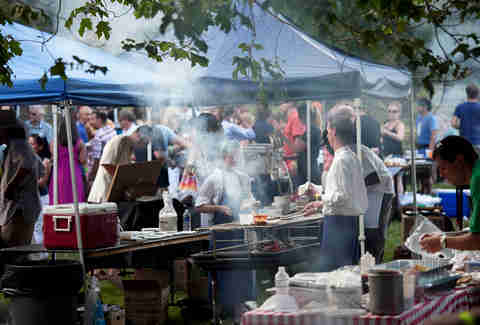 Farmer’s markets are plentiful, and many vendors will represent at multiple locales. But the true destination is Green City Market. Starting in a humble alley in 1998, the market has grown into a year-long institution with serious cred. Every farmer at the market must undergo a third-party evaluation for sustainability -- so your conscience and your taste buds can both be happy. What’s more, the strict guidelines mean that chefs know they can trust the product -- on any given day, there’s a decent chance you’ll be competing for your produce against Michelin-starred chefs. Of the city’s two acclaimed comedy schools, attention bows toward The Second City, yet there’s something uniquely Chicago about the competitive nature of iO. Originally focused on a series of competitive games, the theater married them to long-form improv technique “The Harold” from founding members Charna Alpern and Del Close. Alumni include Amy Poehler, Tina Fey, and Stephen Colbert -- odds are the new kids aren’t going to be half bad. Chicago is unarguably the architecture capital of the country, and Frank Lloyd Wright’s Prairie School is its luminescent capitol. 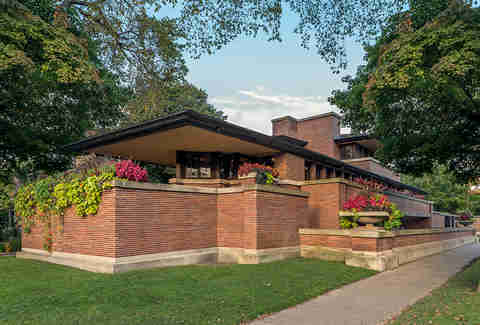 While many of his organic and inimitable works are in suburban Oak Park (or beyond), the crown jewel of Wright’s empire is the Frederick C. Robie House in Hyde Park. A stone’s throw from the University of Chicago campus, two fraternities there actually agreed to donate their houses to a seminary to avoid the demolition of this cherished architectural treasure. It was added to the very first National Register of Historic Places -- as well as any Chicagoan’s must-visit list. As you take the green line west from the loop, the skyline fades away to bungalows and industry. But suddenly, you find yourself at one of the largest conservatories in the country. 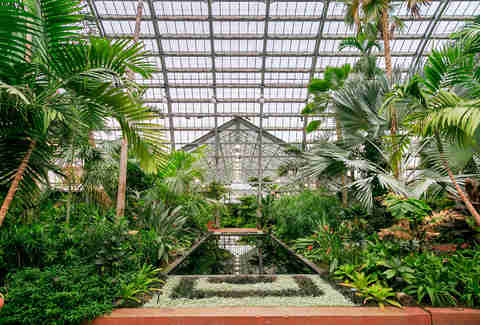 Bigger than its Lincoln Park counterpart by an acre and a half, the Garfield Park Conservatory was founded to show horticultural habitats as they are -- not just as a curio collection. Today, it sustains plants from around the world, with some specimens over 200 years old. Take a trip west when it’s feeling a little cold outside -- a trip through the palm room should warm you right up. The Art Institute never lacked for credibility, but the addition of the Modern Wing cemented its status as a place for everyday enthusiasts to enjoy themselves. And the Nichols Bridge stands out as art of its own -- its Terzo Piano design tempts those milling about Millennium Park to take in a little extra culture. It doesn’t have to be a tourist stop if you answer its invitation to let the city surprise you again. So skip Seurat’s dots and take in something new.